The main variable star research publication of the AAVSO. A unique and colorful web publication that highlights a different variable star every season. Includes background, history, theoretical research, observing suggestions, and more. Fundamental tool in planning your observing schedule each month. It contains predicted dates of maxima and minima in a schematic representaion. The essential comprehensive guide to making variable star observations and reporting them to the AAVSO. Current translations include, French, Spanish, and Turkish with more on the way. Basic introduction and guide to using a Charge-Coupled Device (CCD) to perform photometry of variable stars. This is published on our website only. JD dates are explained and pdf calendars are available. Also convert from UT to JD and JD to UT. The purpose of this monthly email is to highlight new initiatives and ongoing projects in a concise way which we hope you will find informative. Sometimes there is just so much going on that it is hard to keep track of it all. 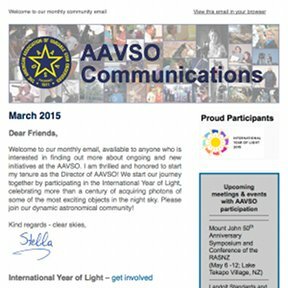 We hope that AAVSO Communications will make it easier for you to see what is happening and follow the links to read more about what intrests you. Includes SID reports, sunspot reports, images, announcements, and more. Forums: General, Help, Software, Campaigns, Photometry, and much more! Dorrit Hoffleit's Autobiography, "Misfortunes as Blessings in Disguise"
Dorrit Hoffleit's essays, "Maria Mitchell's Famous Students" and "Comets Over Nantucket"